Ocean liner was the mode of travel across the Atlantic Ocean, back and forth from New York to Gibraltar, Genoa and Naples, and there are quite a few pictures of those beautiful and majestic ships floating my little family to its next destination. 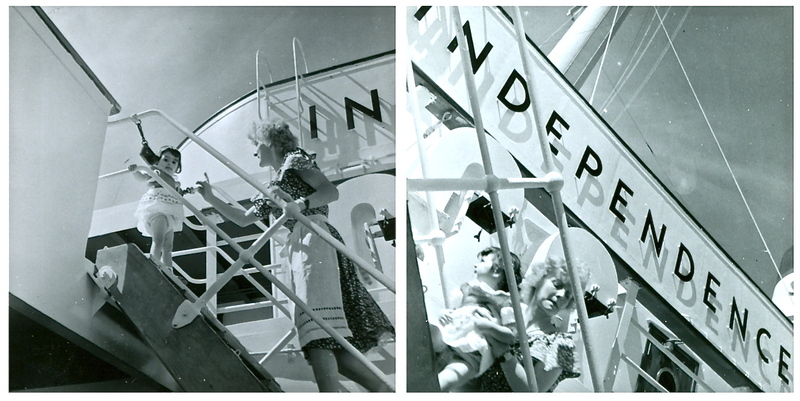 In 1952, when my father left Germany for home leave prior to his new assignment in the Philippines, we bobbed back across the waters in the SS Independence. We were accompanied by the German nanny, Christina, who had become an invaluable member of our household in Dusseldorf soon after I had made my grand squalling entrance into the family. Christina had the responsibility of chasing my energetic toddler self around the big boat, alternately chiding and cooing at me in German. My father snaps pictures as Christina warns me not to go past the chain at the top of the steps, averting me from the terrible dangers lurking beyond its restraint. Maybe she’s explaining the reasons I shouldn’t proceed, believing that my two-year old brain will grasp her meaning, or maybe she’s just waggling her finger, murmuring, “Nein, nein, nein, NEIN, Liebchen;” and hoping against all of her practical experience of the willful little me, that I will this one time, actually hear and obey. Didn’t Christina see those great big letters over my head? She hauls me down the stairway as I wistfully gaze back towards the verboten area now rapidly receding from view, and the exasperated Fraulein Christina appears to be glancing down over the rail to calculate the distance between me and the deep blue sea. I remember that ship and her sister, the USS Constitution (we traveled on both). I was particularly fond of the kid’s playroom. Your Teutonic tutor probably lost 10 lbs on that crossing chasing after you! Such a treat as always!